Every floral masterclass is planned and designed to be unique and to have a different mood each time. 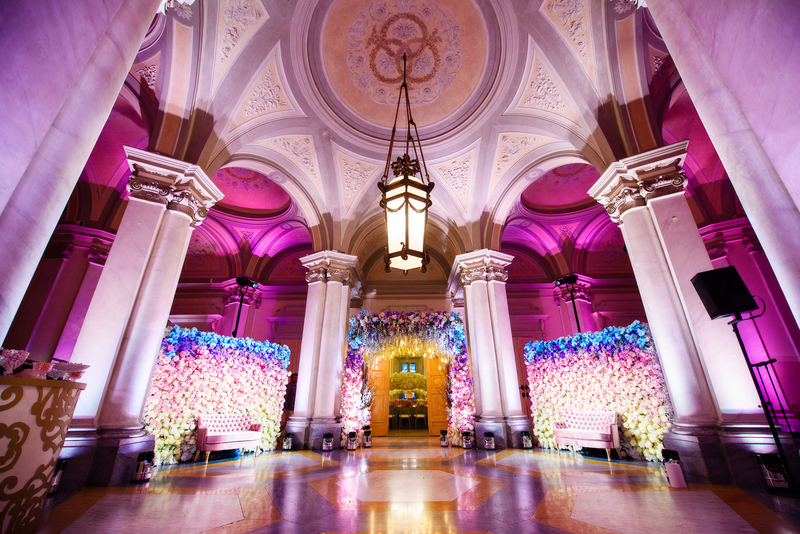 The aim has been to create a fairytale setting through floral arrangements and decorations that transported all the participants and spectators into a fairytale and indescribable atmosphere. 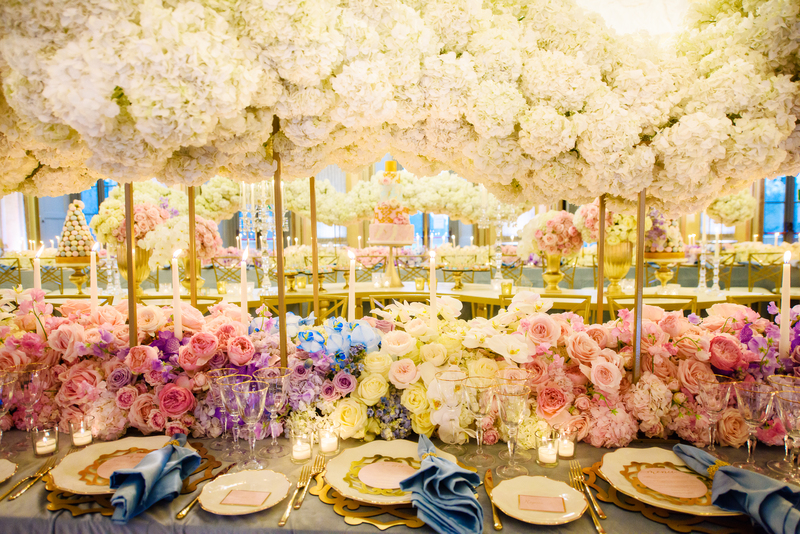 The romanticism of Cinderella story has been revisited in a modern way, in fact a palette has been used in shades of pink and blue, with gold and crystal supports. After a careful search of the location, the Villa Reale of Monza, one of the pearls of italian architecture, has decided to host us for this exciting adventure. 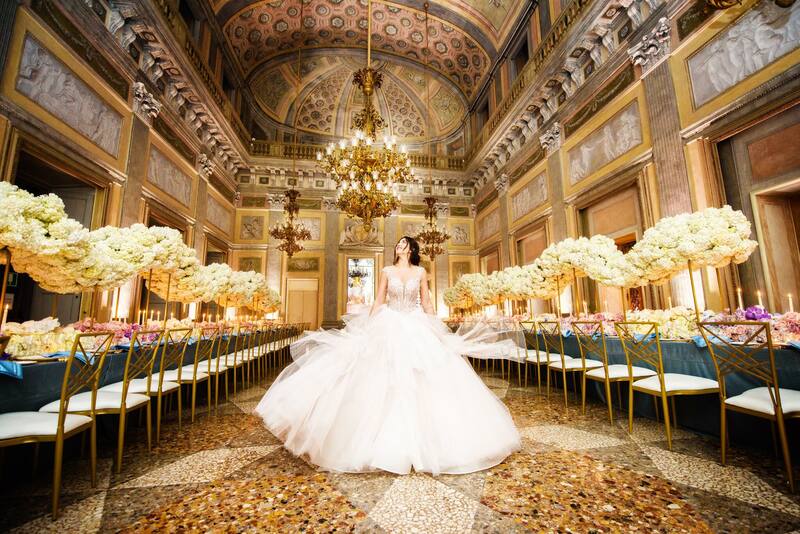 The project, was realized in two rooms, was provided for a spectacular set-up: two large flowerwalls and a roof made of different types of flowers were set up in the entrance Foyer, marking the access to the dinner area. In the Party Room, instead, two imperial tables have been designed with “cloud effect” structures and a central serpentine table has been used for the dessert buffet. The mise en place for the dinner was treated in every single detail, with particular attention to the menu, which resumed the motif of the placemat, and a blue velvet tablecloth. The floral masterclass, has been structured in two intense days of work with an enormous quantity of flowers: hydrangeas, English roses, orchids, delphinium and peach blossoms. After completing the preparation of the two rooms, the course ended with a Gala dinner attended by, in addition to the participants, our partners, the most important wedding journalists and influential people. Afterwards, the evening ended with a party in which she performed an exceptional band from Montecarlo who is got all the guests dancing. We thank all the participants without whom the floral masterclass could not exist, but especially we thank all the official partners who have supported us in this adventure.